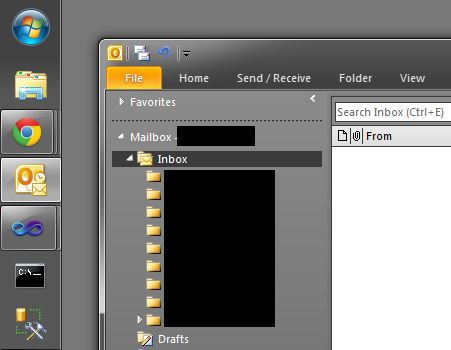 Outlook has a nice envelope icon that displays on top of the taskbar icon when I have new mail. Sometimes this icon comes up when I get a new message, but then doesn't go away when the message is marked as read. The only ways I know of to get rid of it is to close and reopen Outlook, or get a new email. Although sometimes if I'm unlucky the same thing will happen with the new email. Here are two screenshots of what I'm talking about. You can clearly see the new mail icon along with an empty inbox. Just to be clear, there really isn't any unread email (none in other folders, junk etc.). How can I get Outlook to actually recognize when I have no new mail? This is a known bug in Outlook. To get rid of this icon just right-click any Outlook folder with all read mail select Mark All as Read in the context menu. Another way of getting rid of the icon is to fully open an email - any email - in a new window (not just in the preview pane) by double-clicking it. For those who likes keyboard shortcuts, there is a faster workaround than the right click/mark all as read. Select any message in your Inbox and use CTRL+U, CTRL+K. This will mark the message as Unread, then Read, and the envelope will vanish. I see this happen in Microsoft Office Outlook 2013 all the time! It happens when I manually drag an email from the inbox to a folder, and when I have read messages on one workstation and then move to another one. The icon still displays unread even though there are no unread messages in my inbox. The quick keyboard shortcut that I've found is to have one or more emails highlighted in the inbox and press ctrl+u to mark the email as unread, then ctrl+q to mark the message read. I have an even easier workaround. When the new mail envelope doesn't go away I simply click on my sent mail folder and then back to the inbox and it goes away every time. Still is annoying when you work an office job and it happens like 10 times per day. Not the answer you're looking for? Browse other questions tagged microsoft-outlook taskbar microsoft-outlook-2010 icons or ask your own question. How can I stop Outlook from expanding subfolders when they receive mail? How to make Outlook display envelope icon for unread mail in other folders than Inbox? How to situationally show the Envelope icon in the system tray in Outlook? In Outlook 2010, does moving messages to the Junk E-Mail folder train Outlook for subsequent spam/junk email detection? How do I stop Outlook from changing its icon in the taskbar?